Oviposition into the mouth: the case of Rondania dimidiata (Tachinidae) - a literature survey. Here I present my small investigation aimed at finding the original source of description of a very specific and spectacular behaviour presented by the tachinid fly Rondania dimidiata. The fly is known to insert its eggs (larvae?) into a bucal cavity of a feeding pine needle weevil, Barachyderes incanus. The first time I saw a drawing presenting this behaviour was in a book by Jacobs and Renner (1988: fig. T-12, p. 607). On this picture, a fly was standing vis a vis with a weevil grazing a pine needle. The fly extended her long ovitubus towards the mouth of the weevil. The picture (fig. 1a) was supplemented by a short description (in German) "Rondania dimidiate female transports an egg with her long ovipositor into the mouthparts of feeding Brachyderes incanus (Escherich 1923/42)". The situation depicted was impressing enough to stimulate me to try and arrange a life observation of this action. To this end, I collected for some years, numbers of Brachyderes incanus weevils and kept them in captivity for some weeks to see if it was possible flies to rear flies from infected weevils. I suspected that Rondania flies can produce more then one generation a year, so it should be possible to obtain females from this culture that might be brought to ociposition. Unfortunately, no fly ever appeared from the weevils. Lately, I have learned from Czarek Bystrowski, a Polish tachind specialist, that it will not be easy to rear this fly, because Rondania dimidiate is a rare species in Poland, even though it may occasionally appear in some numbers locally. The description under the illustration given by Jacobs & Renner (1988) referred to Karl Escherich, who published an influential series of handbooks on forest insects from 1914 to 1942. At first, I suspected that Escherich's book could be the original source of this observation. Unfortunately, I could not obtain the particular volume dealing with "beneficial" Diptera (including Tachinidae) among Escherich's books, the one. However, in the mean time, I encountered Escherich's original article of 1936 that comprises two pictures of ovipositing Rondania (fig 1b). One was basically the same as in Jacobs & Renner (1988), so it had to be copied or faithfully redrawn for Escherich's book (1923/42). What was important, Escherich's article gave a reference to an one year earlier source. This was a 1935 paper of Dutch researchers De Fluiter and Blijdorp on Brachyderes incanus weevil biology and pest status. Among other topics, they described natural enemies of this weevil, including Rondania. It turned out that De Fluiter and Blijdorp were the only actual witnesses who observed Rondania ovipositing (probably a single female). Eschrisch's records were based solely on the report and illustrations they gave in their article (fig. 1b). It is possible to get this article by De Fluiter & Blijdorp (1935) commercially from SpringerLink (http://www.springerlink.com/content/j541718205357224/), but the PDF from this source is incomplete: the figures are missing. These I obtained finally from the Library of Wageningen University. The original picture in this article (fig 1c, their fig. 33.) 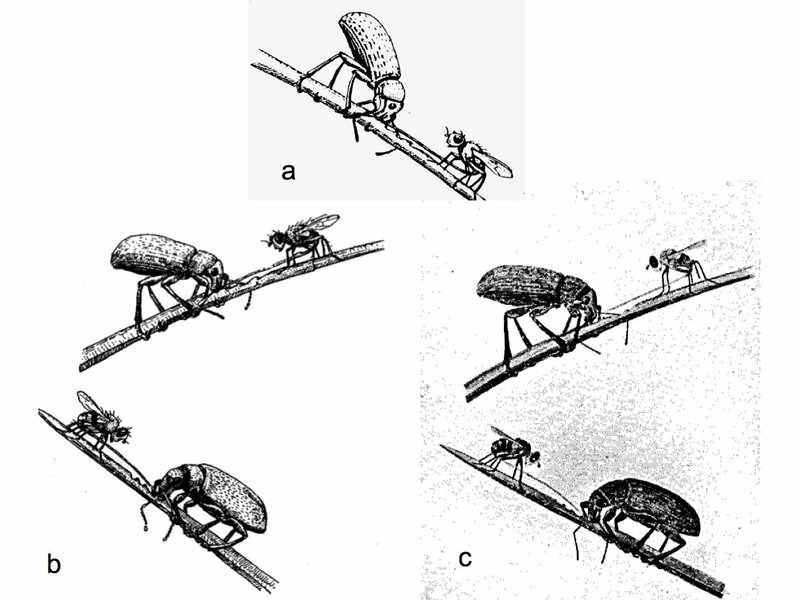 is basically identical to the picture in Escherich (1936) with the exception of details added to the fly depicted by Escherich (1936). As soon as the weevil approached the base of the needle, the tachinid fly landed at a certain distance from the weevil on the same needle, with her head towards the approaching weevil. If the weevil moved towards the top of the needle, the fly withdrew, walking backwards. When the weevil intended to start eating, the fly would bend its abdomen downward and forward, still with her head towards the eating weevil, and move her long ovipositor slowly from between her legs in the direction of the mouth of the eating weevil. This happened very carefully. As soon as the weevil stopped eating, the fly reacted immediately by withdrawing her ovipositor. But if the weevil continued eating, she finally brought the end of her ovipositor between the jaws of the eating weevil. After 1 to 3 seconds the ovipositor was retracted, after which the fly went to another weevil. Whether the fly deposited in fact an egg or a larva into the mouth of the weevil, which was then ingested together with the food, we unfortunately could not examine, because the flies where to rarely obtained. Out of hundreds of new weevils, which were collected in order to obtain more tachinids, only 4 male and 1 female tachinids appeared in June 1934. These were brought together with weevils in the laboratory. The flies died after a lifetime of 10-12 days, during which they where fed with sugar water. The female fly was then examined. After dissection, both ovaries proved to be filled with numerous eggs, which did not show any larvae yet. [...] As already was shown at the description of the mouth parts of the weevil, the opening of the oesophagus is just behind the base of the jaws. When the weevil opens his jaws while eating, the tachinid can very easily bring the end of her ovipositor in of near the inlet of the oesophagus, so in this way her egg easily can enter the gullet. Unfortunately, the further development of the tachnid larva inside the host could not be examined, mostly because of the scarcity of the tachnid. But several times adult Tachnidae were found in the fat body of the weevil. From this description, it becomes clear that the behaviour of Rondania dimidiata could be one of the most spectacular ones among tachinids: one that oviposits directly in the host insect. This way of oviposition may require not only precise finding of the host but also direct exploitation of host activity, in this case feeding bouts of a host. This seems rather unusual even in Tachinidae, that may show very variable and elaborate oviposition behaviour (Stireman et al, 2006). It would be very tempting to investigate this case in more detail but the scarcity of Rondania flies forms an obstacle. Great thanks to Jan Stap for help in translating Dutch text, to Czarek Bystrowski for information on Rondania and to Library of the University in Wageningen for kindly sending me drawings from De Fluiter & Blijdorp (1935). Fluiter, H.D. de, & P.A. Blijdorp, 1935. De grauwe dennensnuitkever Brachyderes incanus L. - Tijdschrift over Plantenziekten 41: 143-210. Escherich, K., 1936. Zur Bionomie und Ökologie des Kieferngraurüßlers (Brachyderes incanus L.). - Anzeiger für Schädlingskunde 15: 52-54. Jacobs, W., & M. Renner, 1988. Biologie und Ökologie der Insekten: Ein Taschenlexikon. Zweiten Auflage. - Gustav Fischer Verlag, Stuttgart, New York. 691 pp. Stireman III, J. O., J.E. O'Hara & D.M. Wood, 2006. Tachinidae: evolution, behavior, and ecology. - Annual Review of Entomology 51: 525-555.